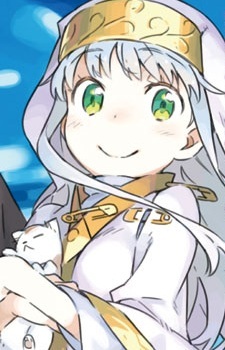 Index, also known by her full name Index Librorum Prohibitorum (禁書目録, "List of Prohibited Books"), is one of the main heroines and the titular character of the series. She is a young nun from Necessarius (必要悪の教会, Hitsuyouaku no Kyoukai, "Church of Necessary Evil"), a branch of the Church of England. Index is small in stature and has a petite build. About 14 or 15 years old, she has thigh-length, silvery-blue hair with very white skin and large green eyes. She also wears a white robe with golden embroidery sewed onto every edge of it, the Walking Church, that prevents any injury on her, but it is later destroyed by Touma when he touched it with his right hand, which is why her uniform is stitched with golden pins. Her mind has been implanted with the 103,000 magical texts of the Index-Librorum-Prohibitorum as she possesses Photographic memory, which makes magicians wonder if she really is human because just one grimoire is poisonous to the mind, and one is more than enough to kill a person without the proper preparative. Her sorcery name is Dedicatus545, "The lamb is devoted to protecting the wisdom of the strongest" (献身的な子羊は強者の知識を守る Kenshinteki na kohitsuji wa kyousha no chishiki wo mamoru). The Church says that the grimoires take up 85% of her mind, so she only has 15% of memory space left to use in daily activities, which allows her to live normally for less than a year. However, all of this is revealed to be a lie after Touma begins to question how the Church even got to numbers like 15% and 85% and finds out from Komoe that the human mind can store an unlimited amount of memories. This was purposely done as the Church planned to make the grimoires harder to access by telling their underlings to perform "maintenance" on her mind in exactly one-year intervals once her memory has come to its "limit"; that way, she will not remember her close friends and accidentally and/or purposely reveal the contents of the grimoires. When she is being invaded by outsiders or injured, her self-protection system personality, Johann's Pen (自動書記〈ヨハネのペン〉, "Automatic Writing"), will be activated to allow her to use magic to cast high-class magic attacks such as St. George's Sanctuary (聖ジョージの聖域) and Dragon's Breath (竜王の殺息〈ドラゴンブレス〉, "Killing Breath of the Dragon King"). Her self-protection system will use the Feather of Light (光の羽, Hikari no Hane) to force a reset on Index's own memory should a manual reset fail to be performed. Although she does not know that she has magical powers, she can easily identify the types of magic by seeing it or somebody describing it to her and know how to counter them. Her vast knowledge of the Index-Librorum-Prohibitorum within her mind makes her to be one of the most powerful characters so far and becomes very helpful to her friends in various situations using skills like Spell Intercept (強制詠唱〈スペルインターセプト〉, "Force Chant"), and Sheol Fear (魔滅の声〈シェオールフィア〉, "Voice of Destruction of Evil") and makes her a target of interest for many. She is often elated by a variety of things and is slightly ignorant and curious of modern technology. She usually is gentle and polite with people and has a kind nature, but she is also easily irritated especially by Tōma who usually ends making her mad in some way as consequence of his bad luck which ends with her biting him. She also has an large appetite and uses any excuse to get food from anyone and likes watching an anime series called Magical Powered Kanamin. She has strong feelings towards Touma and even confessed her love after hearing Touma lost his memories because of her, however he avoided answering by changing the subject of the talk since he has no idea about what kind of feelings he used to have towards Index. When she returns to England, she is sought out by Fiamma who wants her knowledge and reactivates Johann's Pen mode. Later during her stay at Necessarius Headquarters at St. George Cathedral, she learns the bitter truth about Touma when Fiamma reveals Touma lied to her about his memories, which sends her on a rampage and grows angelic "Red Wings" and corners Stiyl with ease who tries to restrain her just by flapping her wings. She also has displayed the ability to summon legendary weapons and artifacts as she did in the volume 21 and use them to attack, the main weapon of her selection was the "Sword of Freyr," the magic sword of the god from the Norse Mythology, which fights on its own "if wise be she who wields it" and was stated its wielder has never suffered defeat. They’re cute. They’re adorable. They’re tiny enough to fit in the palm of your hands. In this list, we’ll be taking a look at 15 chibi character representations in anime. Join us as we present to you the most beloved anime girls with white hair, silver hair, grey hair and some in between on MAL. They may lack exotic hair colors, but the snow white and sophisticated silver shades of their beautiful locks are just as breathtaking!